Find availability and pricing in your area TODAY! We are a free LOCAL Referral Service. Care Facility options or care at home. Click on the button below to see what’s available today! Same day assistance, our families never pay a fee. Assisted living facilities have different levels of supervision and care. They are licensed with the State of California, Department of Social Services as residential care facilities. If your loved one has memory issues, or has been diagnosed with Dementia or Alzheimer’s Disease, we can help. Let us find you options in your budget TODAY. We are available seven days a week to discuss availability and pricing in your area. Whether it is an immediate or a future need, our experts will guide your family toward the best senior living options and home care companies. Our services are confidential and can help you make informed decisions regarding senior care. We are available every step of the way as you search for the right Assisted Living Community, Board and Care home, care services in your own home, or specialty Alzheimer’s and Dementia care. At no cost to you! We have many resources for the senior in your life, click here to see how we can help. Call us at (805) 405-2411 today to get started. 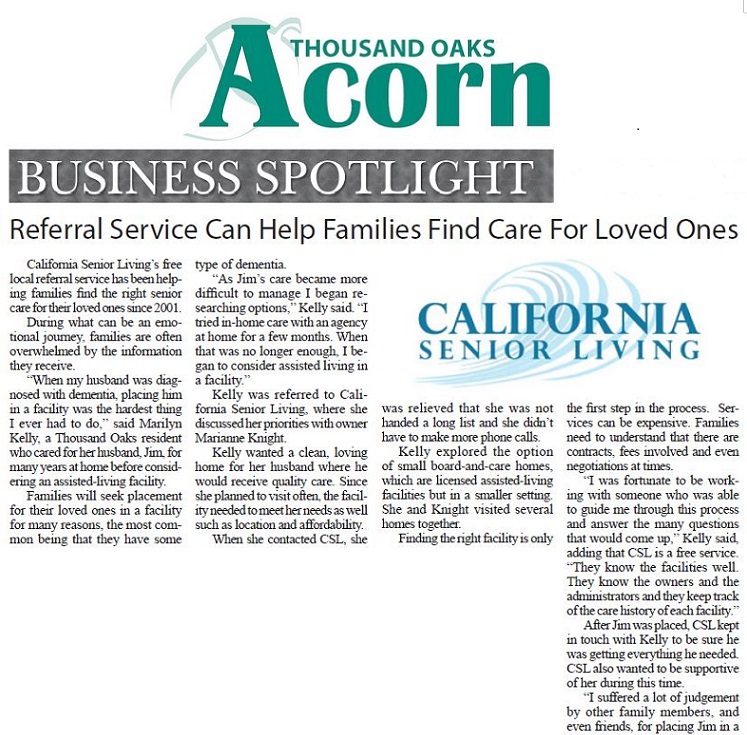 Click here to read the Thousand Oaks Acorn Business Spotlight about California Senior Living.